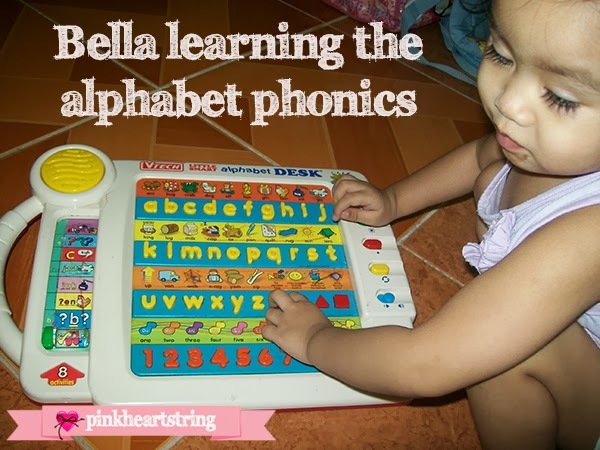 Pink Heart String: Alphabet Phonics Perfected! My two years and one month old daughter perfected the alphabet phonics tonight. She learned this before but I wasn't certain if she could memorize all the letter sounds. She knows the alphabet (and what each letter stands for) but phonics is a different thing because this will help her learn how to read. I tried to spell words for her to read since I knew she already know the phonics. But you know how kids are. Sometimes, they'll make fun of it. So, I tried reviewing her the alphabet phonics tonight and she really know them all! Way to go Bella. Guess she could learn reading in no time! Bella learned the alphabet, numbers 1-10 (but now she can count until 20), animal sounds, colors, shapes, body parts and a lot more when she was 1 years old. Well actually, when she started talking, she already knew all of it. This could be the result of reading to her and letting her listen to nursery songs while she was still inside me. I also let her watch nursery songs and other baby videos that could help her learn at around 2 months old. By the time she learned talking, she already know all of it and I was more than happy that things turned out the way I want it to be. I'm kinda running out of things to teach her each day because it seems that I have taught her everything that toddlers can learn in school. We are actually thinking of sending her to playschool so that she can also develop her social skills and she'll be able to mingle with different types of people. We are happy about how fast Bella is learning. But life isn't just about phonics and numbers. There are still a lot of things she needs to learn especially how to control her tantrums haha. That's all for today. You might think I just wrote this to brag about my daughter's development but no, I was happy and wanted to mark this day as one of a vital step in her ladder of learning and development. At what age did your kids learn the alphabet phonics and started reading too? Oh Wow! I would love this for my grandson. It's never to early to introduce learning. My daughter is 3 and she started at 2 1/2 by using products like this. I don't have kids yet but its cool that she already knows letter sounds. Most people think that learning letter names is more important but like you said, reading is all about phonics so its much more important. What a clever cookie she is! That's so fantastic that you have been actively helping her to learn as much as possible since even before she was born. Great idea to watch educational videos on youtube with her. I really want on of these.my three year old likes doing his letters and numbers, but he has trouble with annunciation. Awww! Your daughter is learning so much and so quickly! My son just turned 2 at the end of July and it's amazing how much he is soaking up. He has also learned his alphabets and phonics, and I'm so excited to teach him more. He's really engaged, just as your daughter is. Such a great thing to see them learning so young! Wow! That's amazing! My son is not quite two and is just becoming really good at naming body parts and animals and making animal sounds lol! He's a little behind your daughter for sure! I like those videos and I'm going to show them to him! My daughter was like this too. Very early she memorized the phonics sounds and letters, my son is still working on the phonics.